Enter up to five questions to ask the user. The default question will be a text field entry. If one of the question is for their email address, then check the email field so that if they choose to hit the email button after the survey, their address will be auto populated. If the question is a Yes/No, check this box and Yes/No buttons will be shown instead of a text field. If the question is a Multiple Choice question, click the arrow icon to add the answers for each question. Note: If you are interested in collecting email addresses and are enabling several different upload options besides email, you may want to ask for the email as one of the survey questions, as this will ensure that more users will enter their address as opposed to only the ones who choose email as their upload option. You can show a disclaimer screen to the user before they upload and ask them to agree to the terms and conditions before they upload. If they don't agree, they won't be allowed to upload. Select a .txt file with the text of the disclaimer to be shown. You can also use a png image instead of text for different layouts or foreign characters. 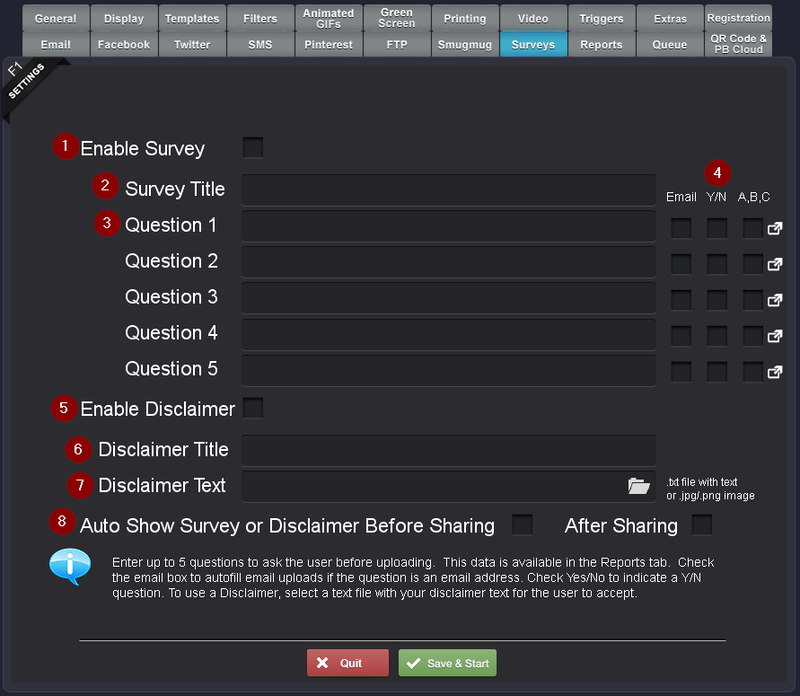 Checking Before Sharing will show the survey or disclaimer as soon as the user selects a photo. Otherwise, it will show once the user has chosen one of the sharing buttons.